If there’s one thing I’ve learned in life, it’s that bad news sells. After spending two in-person sessions with a Sports Illustrated journalist named Luke Winn, I was excited to see the story he had written on the 20th Anniversary of the Upper Deck Ken Griffey Jr. rookie card. After sharing all the exciting positives in the industry and how excited we are about the future, the editorial ended up being a total hatchet job on the industry. One of the points (in bold, no less) included in the article was so far off base, I felt like I got sucker-punched by a buddy. They printed, “Card shops have died off at an alarming rate, down from some 5,000 in the early ’90s to 500 now, according to Sports Collector’s Digest.” I know this to be inaccurate because I currently send out more than 1,200 marketing mailings to active sports card shops in the United States and to more than 300 sports card shops in Canada each month. Mind you those are just the shops Upper Deck works directly with as there are plenty of other shops that don’t work directly with us who carry sports cards along with other products. There was also an assertion made by Sports Collector’s Digest about what the total revenue was in the market in years prior and what it is today. As a privately held company, Upper Deck doesn’t release any financial information so how did they get this and why did those numbers seem so off base? We were mystified and got on the phone with F+W Publications, the parent company that publishes Sports Collectors Digest. I’m sorry too that the thousand-plus shop owners of sports card outlets throughout North America working to promote the hobby got the short end of the stick with this highly questionable reporting. The truth is sports cards and sports card shops are doing okay and collectors are still enjoying the hobby. Things are not great, but they certainly aren’t terrible. Sports trading cards have been around for more than 100 years; they are not going anywhere. Here’s the truth per sport on the current status of sports cards that I know firsthand working in the industry, talking daily to these shop owners who are selling the products. Basketball sales have been down the last couple of years, but there is still a following. Baseball has been status quo in terms of sales, but prospects like Stephen Strasburg and Bryce Harper have collectors chomping at the bit. Football has seen steady growth and continued demand over the last two years in particular. The biggest surprise of all has been hockey. Blockbuster players like Sidney Crosby and Alexander Ovechkin have international appeal and there is high demand for their collectibles. Niche sports like golf and mixed martial arts have also caused quite a buzz as of late with new collector groups emerging. Upper Deck sales on new sports card releases has been strong. But what about the shrinking number of hobby shops? Yes, there are fewer today than there were 15 years ago. Absolutely. Commerce has changed and the way people buy and sell products has been revamped. How many cards were being sold on e-Bay in 1990 when sports card shops were at their peak? Zero, because there was no eBay. Online auction sites like eBay and online marketplaces like Beckett.com offer a new stream of e-commerce for collectors and dealers so fewer retailers are needed in the category. And I can tell you without a shadow of a doubt that those shops that are still catering to collectors’ needs are fantastic. They run special promotions in their stores and have celebrity athletes make in-store visits to sign autographs. They also make collecting cards a real experience in a fun atmosphere. 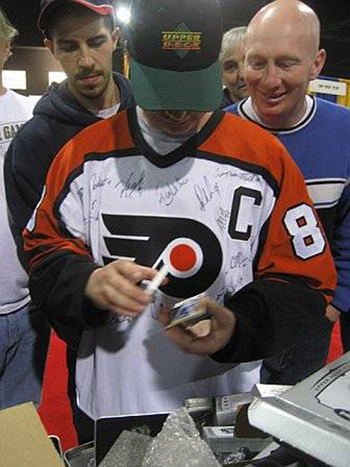 Upper Deck sponsored more than 30 promotional nights at hobby shops in September alone where we sent out prizes, apparel, gift certificates for refreshments and everybody walked away happy. 10. You don’t have to wait 30 years before the cards you buy today are worth something. There are Upper Deck cards that sell for thousands of dollars, pulled right from today’s packs. So many cool innovations have now made opening a pack of trading cards a thrilling experience. Upper Deck randomly inserts high-value cards into packs with swatches of the player’s actual game-worn jersey, autographs, multi-signed autographs, cut autographs of deceased legends, fossils from dinosaurs, hair from thoroughbreds. So many unusual finds, you just won’t believe it! 9. Go to YouTube and search for “Upper Deck Box Break” and you’ll find more than 15,000 videos of collectors opening up Upper Deck products and showing collectors online what they got. People are now sharing the collecting experience through video and the crazy thing is, people are watching them – thousands of people are watching them. 8. Last week when Upper Deck offered up a product called 2009-10 NBA Exquisite for the low, low price of $600 per pack, the entire run sold out in less than four hours. That’s right, I said $600 a pack. In this economy. Three-pack cases of the product are now selling for well over $2,100 on eBay. How can things be so bad if people are spending over $700 on a pack of Upper Deck basketball cards? 7. Hockey cards have been huge over the last four years in particular and the category has seen double digit growth. We are poised to have one of the best rookie classes in years and retailers are very excited about it. Can you believe it? Hockey cards. If you don’t believe me, call Wayne Wagner at Wayne’s Sports Cards in Edmonton, AB and ask him how hockey cards sales have been for him. He can be reached at (780) 483-3177. 6. 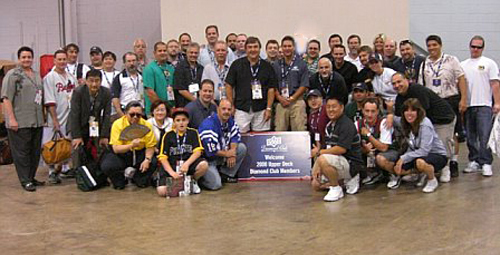 Four years ago Upper Deck started a loyalty program called the Diamond Club for the top collectors in the industry. This group of 125 elite collectors distinguished themselves first and foremost by spending at least five figures annually on Upper Deck cards for their collections. But just spend five minutes with these passionate advocates for collecting and you’ll start opening packs without even realizing it. It is now a program where we receive bins of applications to try to get in each year from collectors spending tens of thousands of dollars each year on trading cards. 5. Other media are blown away by the fun of the sports collectibles industry. Click here to see what Bill Simmons from ESPN thought about the same industry show I spent time with Luke Winn at. 4. Upper Deck has embraced new technologies and online opportunities. We developed an online interactive community catering to kids designed to make trading cards relevant called Upper Deck U; check it out at www.upperdecku.com. 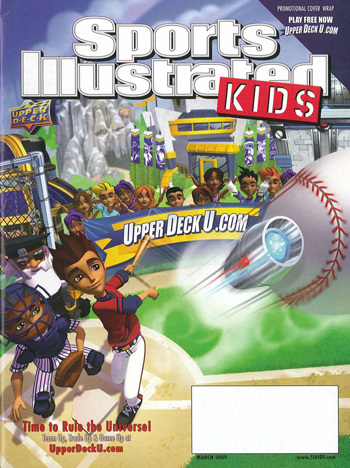 So while Sports Illustrated went out of its way to report that the category is on the decline, it was okay with putting UpperDeckU on the cover of Sports Illustrated for Kids earlier this year. Maybe they’re not on the same page. 3. Kids still think sports cards are cool which is very important. The coolest kids I know are the 2009 Little League World Champion Park-View All-Stars. Click here to see what they thought about appearing on an Upper Deck trading card. 2. Eighteen months ago we were bracing for the worst with the recession really kicking in. We concerned like every other industry and we were concerned we could lose as many as 30-to-40% of hobby shops. We only lost about 5% over that time period and actually saw new shops opening up. We continue to get new applications to open up accounts with us. When the economy is bad, collecting can survive because people don’t give up on their hobbies. With more and more people electing to take “staycations” these days, card collecting offers the perfect at-home activity for families. 1. Wait till you see 2010 Upper Deck Baseball releasing next February. We announced just this week we will be investing a tremendous amount to add a high-end line of inserts called “Exquisite” to the product and that the content is going to be amazing. We’ll be announcing even more exciting promotions around it in the coming months, but 2010 Upper Deck Baseball – in a word – is going to be awesome! During this recession we have seen banks fail, the automotive industry on life support and newspapers folding. But trading cards go on. There is something indescribable about the bond between a father and child where fond sports memories are intertwined with that 2½-by-3½ trading card. There is something wonderful about trying to stop your hands from shaking after you open a pack of Upper Deck cards and discover an autograph card of your favorite player. It’s an experience to some, an investment to others, a business to the rest, but everyone with an affinity for the hobby got involved with it because it’s fun. And industries that provide their consumers with fun are not going anywhere. They are here to stay. 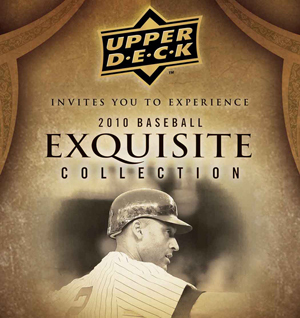 Watch Derek Jeter Visit UpperDeckU! Unfortunately, only veteran collectors know to not put any stock into what Sports Collectors Digest says. T.S. is a tremendously nice guy, but that magazine is the laughing stock among many of us. What I’d like to know is: What you going to do about getting Basketball back? There are many of us who are very unhappy that Panini has obtained the exclusive deal. No more UD Exquisite Collection basketball? Really? I just can’t accept that. I’m being 100% serious. From what I’ve seen from Panini so far, the quality is going to be nowhere near as good as Upper Deck. The card industry dead? Tell that to the 60+ people (customers) we had in our store for our monthly drawing on September 30th (just last week). Monthly, we attract those type of numbers and before you say well they only come once a month. Not true. They must come in, purchase product through out the month and receive tickets for our monthly event. We get families, moms and dads, it has become sort of a cult following and we always seem to have new faces every month. We get great support from the manufactuers, leagues and distributers. People only hear the negative, because the positive never gets out because the real shop owners are working to promote their store and take care of their customers ansd work with others to make this hobby work. Is it all great, no, but you can say that about any industry. Thanks to Upper Deck for trying to set the record straight. I’m Gene Webster from Webster’s Sportscards and even during these tough economic times I have seen great interest in card collecting. A few of my customers may have cut back but they have not quit. I actually have added several new customers in the last year. We are still here and still going strong! I have recently been asked by both customers and national publications how the sports cards industry is doing and as a veteran store owner for over 20 years I can honestly say it is doing quite well. We have seen numerous changes over the years some good some not so good, however the hobby has endured and it will continue to endure, why because once it becomes a part of you, whether it was collecting as a child or if you started as an adult, it stays with you. Collecting is our connection with the sport we love so much, it is that rush you get when you pull that special card or spending months searching for a card you need to complete your set and then one day there it is. “It reminds us of all that once was good”. Are you kidding me, how does any decent publication allow this to happen? Great article. Shows that there is a lot of life left in sports card collecting. It’s a sports card messageboard with over 2000 members in just a year. 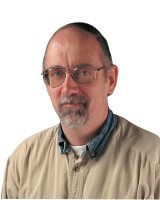 Wow … very well stated by Mr. Carlin and once again SCD only further justifies why they have become a laughing stock in the hobby and a shell of their former respected self and voice of the hobby. With SCD as a friend of the hobby who needs enemies? I also read the SI article and while it wasn’t the worst reporting on the hobby that I’ve ever come across, it is safe to say that it didn’t point out too many positive aspects. It reminded me of an article that ran in one of the Denver papers ~5 years ago in the midst of the steroid issues. A friend of mine offered an hour worth of positive hobby quotes, only to have the article come across as a hatchet job. You would have thought that the only players who cards were made of included Bonds, Giambi, Sosa, Palmeiro, and no stellar players like Jeter, Pujols or Helton (Hey, I’m in Colorado). Heck after looking at my IRA and reading about Bernie Madoff in the last year, I can assure you that buying cards was not the worst investment ever. As a child, opening up my first pack of cards in 1978, the best think I could have hoped for was a cool Pete Rose card (which I lucked out and got) and a stick of gum that I wouldn’t let near my mouth these days. One of the benefits of owning a store since December 11, 1992 is really seeing the hobby morph into something almost completely unrecognizable to collectors from that time. I’m quite sure I wouldn’t still be making it the way I am now selling the $1.00 packs that filled store shelves at that time. Like Jeff, we host monthly Trade Nights and while we might not see 60 people at each one, I can assure you that there are still droves of collectors who stop by frequently enough to make owning a store as much fun as ever. In spite of the last year and the economic problems we have seen as a society, our sales are still incredibly solid. It is a massive tribute that so many of our customers have continued to make coming to my store and others a priority in their lives. With the amount of customers switching to purchasing online, it only makes sense that there would be fewer card stores, but that the ones still in existence are the cream of the former crop. Thanks to Chris Carlin and the people at Upper Deck! The hobby is far from dead in southern Illinois, we can vouch for that! Every month we see more and more new customers coming into our store to enjoy card collecting. We host Trade Nights on 2 different Saturday nights per month and average over 50 people per night! The good stores are still here, offering promotions and service to their customers, and the manufacturers do a great job to help us do just that. Thanks for putting the record straight. It doesnt surprise me that an Editorial got twisted to slant towards the writers perspective , it happens all the time and has personally happened to me! DONT TRUST EVERYTHING YOUR READ!! I have been collecting since 1968! I have never felt so passionate about collecting cards, as I feel today! We are in the midst of the greatest sports icon period in history with names such as Tiger, Lebron, Sidney, Michael, Wayne, Brett, Derek.. Heck so good I dont even need last names! Collectors today have more choices than ever before; we have retro looking products like Champs or Goodwin, High End Gold like Exquisite and cool looking $1.99 packs that have unique creative designs and inserts galore. 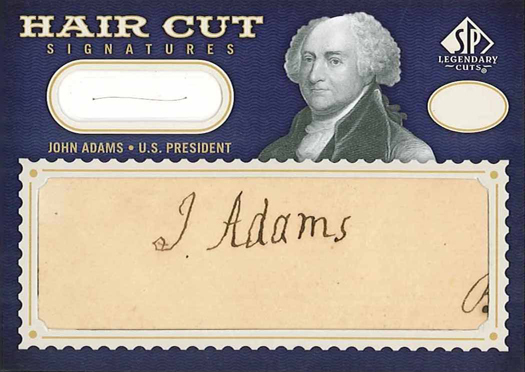 In the last ten years or so we have witnessed the advent of GU Relics, Autos, Fossils, Cut Signatures and DNA cards, hands down the engine that keeps the hobby going uphill! I personally have rediscovered set building thanks to products like Goodwin & Champs. A act I thoroughly enjoyed as a child has come back full circle. And it is still as Thrilling to knock that last need down and file a set away as it was 40 years ago! That article, that writer, thats one opinion! Im sure we are about to see a floodgate of opinions be open that speaks volumes to the contrary! I have been a member of the Diamond Club for 4 years and I can truly say if they left me off the list for year 5 I would still buy my ball cards because I love my hobby and Upper Deck . i say the hobby is growing or the people at Upper Deck and topps would not be putting the money in it that they are. I collect because I feel that it is my hobby. I love my hobby and will stick with it. It seems to me Upper Deck has always treated me great, and has come through with everything the have promised me. I know Chris and he is dedicated in every aspect with Upper Deck. There will always be HATERS out. they will attack everyone and everything(people get paid to do that?). I will stick with my hobby and will defend it. I have been a collector since 1987 when my father took me into my first sports card shop to buy card supplies to protect the cards he had when he was a kid. That hobby shop was open until the owner passed away 15 years later. I still collect and have a hobby shop that I have been patroning for the last few years. I have several hobby shops around and as long as there are collectors, there will be a hobby shop for them. The market is at times slow, but so is the auto and housing market, but get something new out and people buy it. 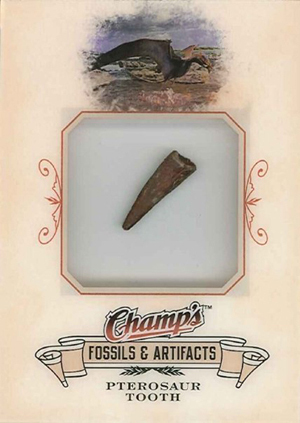 Bring something totally cutting edge out and people flock to it, just ask Upper Deck about the Dinosaur cards, the Goodwin Champions case hits, the DNA Cards, and the everything else they reinvent to keep the industry alive. There is so much misinformation out there about card shops. Print media only reinforces the stereotypes that are perceived by those who don’t collect. It’s harder to find a good shop in today’s market, which is why I try to go anonymously to card shops to see if they pass the grade. Any shops that fit a simple criteria of being welcoming to adults and kids, have current product, have the ability to look through and purchase single cards, fair pricing and a friendly, knowledgeable staff, go on the sidebar of my blog as being an approved card shop. So far, of the shops I have entered in the past two years, only two have passed that simple criteria. RBI Sports in Burbank, IL. and Matt’s Sports Cards in Joliet, IL. You would be amazed at how many shops fail that simple criteria. I hope to drive more business to the best shops and support our hobby that way. It’s always nice to hear two sides to every story. I think that’s one of the most important things in communication. Always has been, always will be. And I found the first portion of this blog entry to be enlightening and interesting. But, let’s be real: sports cards are on the decline, since the two major players in the industry will no longer produce NBA-licensed basketball cards for a while, and the major powerhouse in the game will no longer produce MLB-licensed baseball cards for a while. Ouch. That’s a sting to many, many people. I feel bad for the employees at Upper Deck, and I feel bad for the hobby enthusiasts. There are many people who attempt to, and do, make a living off of this industry, and the lack of presence from Upper Deck and Topps will only hurt the hobby. Sure, some enthusiasts are wanting a fresh take on things, and I’ve seen a lot of open arms embrace Panini into the American side of the things. But I say again: sports cards are on the decline because competition breeds innovation and better prices. I’m not a collector who buys boxes or packs. I don’t build sets. I go to the secondary market to attain the cards I want. The secondary market is a world of its own. And in this secondary market, I cannot buy a pack of 09/10 Exquisite Collection basketball for $600. Upper Deck might sell them at that price to distributors and shops, but that’s not street value — it’s not what the consumer pays. And it’s the ultra high-end products like Exquisite Collection that also are hurting the hobby. Don’t get me wrong, I love the notion of Exquisite Collection. I remember in 2003 when the first set was announced, it was supposed to be a one-time only affair. That changed, because it was a serious money maker. When 08/09 Exquisite Collection basketball hit the streets, people were paying anywhere from $900 to $1,300 a pack. And then they were disappointed because they were pulling autograph cards from people who, frankly, shouldn’t be in a limited high-end product. Just the other day, I saw someone pull a Brad Miller Exquisite Auto Patch /22 from a case of 09/10 Exquisite Collection. Brad Miller. Let me say it again: Brad Miller. And by the looks of things, that was the case hit. Seriously? The case hit? I’m not trashing on Miller, but, like Exquisite Collection is to the hobby, the product itself is supposed to have the best-of-the-best. And my point with all this is: People who have the money to bust Exquisite sometimes try to recoup what they’ve spent. I know someone who sold the contents, all 15 cards, from a case of 08/09 Exquisite Collection basketball. He paid $2,200 for the case, and made $430 back. Ouch. So, really, the idea that cards are worth money now is an inflated one — it tiptoes around the truth. Even Michael Jordan and LeBron James cards have plummeted in price, due to various things like the economy, and also because of oversaturation. Oversaturation is another big problem that’s hurting the hobby, and why sports cards are on the decline. There’s a problem when Michael Jordan autograph cards are no longer limited. Even if sets are numbered out of 25, there are at least a dozen products with sets just like them. So, say Jordan has 20 sets at 25 cards a piece. That’s 500 cards a year, just from those 20 sets. But Jordan has a card in nearly every autograph set, in nearly every product. Jordan autograph cards are produced by the thousands these days, and there’s something wrong with that. Sure, as a collector, it’s nice to be able to grab a Jordan autograph for under $500, heck, even $400. But it is hurting the hobby because the more something becomes available, the less desirable it becomes. Another thing that’s hurting the hobby is the redemption card. People have lost trust in companies because they feel duped when they redeem their cards and are given replacements that pale in comparison to what they were supposed to receive. I know people who still have outstanding redemptions from Upper Deck and Topps, and they’ve been waiting on cards for the past three years. If that’s not a problem and a serious and alarming issue for the future and well-being of this hobby, then I don’t know what is. This blog mentions using YouTube as a scale on which to gauge the popularity of sports cards. The blog suggests searching for “Upper Deck Box Break,” and says there are thousands of videos out there, which concludes that “the hobby is not on the decline.” However, I’m willing to wager that of those thousands of videos, there is a great percentage of people who are not happy with Upper Deck (or Topps, etc.) And this is for various reasons: Maybe poor redemption policies, maybe lackluster pulls, maybe bad customer service experiences, etc. So, if you’re going to use YouTube as a scale for how the hobby is surging, then it should also be used as a scale for how it is hurting. I love Upper Deck and Topps, but both companies have their faults. Upper Deck is really going out with a bang, with the release of 09/10 Exquisite Collection basketball. But I’m afraid it’s too-little, too-late; and it’s, truly, a compromising product. Why? Because there are redemptions that have hand-written information on them. What’s to stop someone who has a lackluster redemption from grabbing a pen and writing on it? That’s a can of worms and another big trust issue with hobbyists. So, yes, the sports card hobby is on the decline. I don’t think the hobby will ever die, but it’s certainly limping, trying to find shelter. Us hobbyists make this game what it is, and we’re smart enough to notice the disrespect we’re sometimes shown. Word of mouth and money have some power, and more and more each year I’ve seen large numbers of people flock away from the hobby because they’re not content. And it’s disheartening, because a simple way to fix it would be for companies to listen to us. Pay attention to us. Start there and it’ll be the start of reconstruction. Interesting read, still shocked that KOBE is no longer with Upper Deck, but with themnot having an NBA license I dont see it being a big deal. They still have MJ and Lebron.. BOTH are better than Kobe anyway. It’s a sports card messageboard with over 5800 members. As a lifelong collector who is loyal to the hobby, I was personally offended by the lack of observation and research that was put into the article. 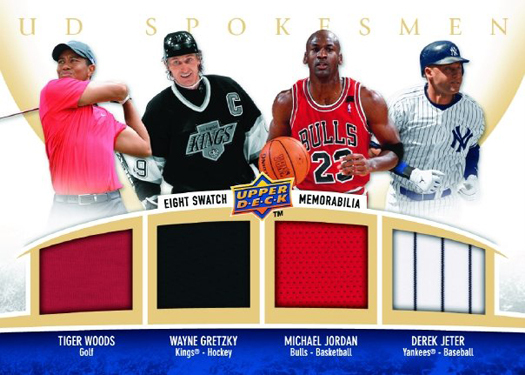 It is nice to see Upper Deck respond to it publicly and set the record straight. The hobby is just as exciting today as it was in 1979 and 1990. The innovations are amazing, the designs are gorgeous and the players are better than ever. Not to mention that the hobby community is tighter than ever with all the shows, online communities and Upper Deck’s Diamond club. This hobby isn’t going anywhere, anytime soon! collecting is a huge part of my life and isnt going anywhere, upper deck is a solid outfit with some really great staff members. chris carlin is an outstanding representative and a gentleman. my friends and i will continue buying sportscards and adding to our collections for years to come. get real. I think the main reason people may think sports cards are on the decline is because of sports card shops closing in recent years. However, I would attribute to card shops closing down to eBay and other online sites and just the internet in general. Prior to 10-15 years ago there was no eBay or anywhere online to purchase sports cards. Now some people chose to do their business solely online as the prices are often cheaper for boxes and singles. Still though, there are those that are loyal to their shops and those that prefer to get their items right away from their local shops instead of waiting to get stuff from online. While the internet has helped actual card collectors, it has hurt some local shops by taking away business. I started collecting in 1996 but seriously started collecting in 2000. I should also add that during the past years of cards being produced only to the American and North American collectors the hobby now is also reached parts of the world where there is no professional league or sometimes no connection to the sport. I have travelled extensively around asia and do find hobby stores even in small islands like singapore, malaysia and taiwan. I have seen Malaysian and Filipino collectors showing off their Exquisite and other card collection on youtube. Someone really forgot to see where this hobby has landed in the present time. I am writing from the Philippines and boy i can confess how much people buy basketball cards through ebay and other resources having only one hobby store throughout the Philippines and i am one of the collectors who spend part of my savings on those basketball and golf cards produced by Upperdeck though i dont play golf but watch the nba on cable TV. Its surprises me that with all the current image problems that M.L.B has had over the years they would terminate their contract with Upper Deck? After all you would think it would be positive advertising for them. To Jon Bryant: That’s the best you could do? I hope you weren’t dumb enough to sign your real name to that garbage post. How lame. We have been in business 23 years and expect to be for a long time in the futuire. Sports Card Digest is the laughing stock of the industry. It has gone from 2 complete sections to less than 50 pages in most issues. Instead of bashing the industry that it gets its money from it should be supporting it. I have been collecting cards for 50 years and it is as fun today as it was when I started as a nine year old. I collect because each card is a piece of the history for that sport. Living the Dallas area, when I go to the card stores I still see people ripping wax and enjoying the fun of the rip. As stated above, don’t believe everything you read, lots of writers have an angle they want to push and make the story read from only their point of view. Card collecting is live and well in North Texas. The card industry is far from dead. Collecting sports cards is my #1 hobby and it has become a passion over the years. The hobby continues to evolve every year and keep collectors interested and coming back for more. 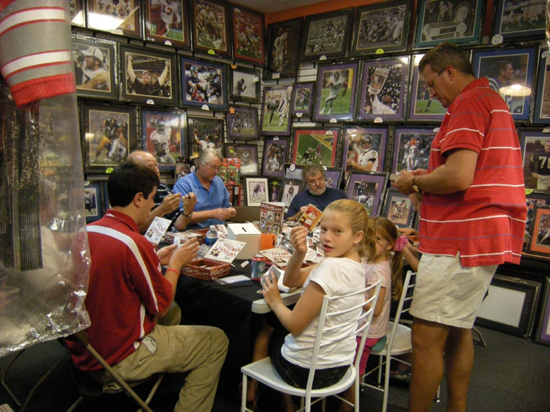 For true sports fans, there is no better way to get closer to the action than collecting sports cards and having the opportunity to own autographs and game used items from our favorite players. I have been collecting for over 20 years and I don’t plan on stopping anytime soon. I do not believe that the industry is dead. Although someone in my office saw a piece on TV last night that it was dead because the younger generation is staying away. He also said that only one company is making baseball cards. I explained that yhe 2 licenses split next year and that UD is still making baseball cards. He realized that the media put there spin on it just as they do for many other stories that are covered. My local shop had a UD SPx NFL tailgate party last night. The winners of the grand prize and other prizes were folks that I had not seen in the store before. As they were leaving they commented on coming back again. Through trade nights, emails, Facebook and other outlets, stores in my area reach out to many folks who are keeping the hobby alive and well. I do not concur with TS O’Connell as he fails to understand the dynamics of sports card collecting. I have been busting boxes/cases since 1971. I use to save my allowance back then to pull that special Willie Mays card that everyone one on my baseball team wanted. Back then I remember seeing fathers/son at card shows and that’s what I still see at card shows…father, son and daughter. Collecting will always be here. Yes, card stores have been closing in cities that I visited (I travel over 100K per year) but that is happening with many businesses…and yes the economy is bad but part of the decline in the number of shops was having a robust internet market. Shops that surviving today, especially in San Diego, Los Angeles, Hawaii (places I frequent), have more business. These survivors provide more services to collectors such as grading, trading activities, internet service, redemption service, autograph signing sessions, contents…yes, the majority of the stores that went away, especially in San Diego, I can say with confidence were nothing more than a man behind a counter with shelves of packs. The number of collectors are still here and continues to grow…giving up on sports card collecting is like giving up on sports. Cannot be done. In addition, Upper Deck has been responsible for the injection of excitement with revolutionary releases that forces the competitors work harder. Its tough to keep up with UD robust ingenuity that creates more collectors in the sports card business. Its their mission. I met TS about 10 years ago and have had several conversations with him about this amazing hobby of OURS. TS does know the Vintage cards but, He did not seem to updated about newer issues. I am a ripper of these new products. Baseball, Hockey, Football Basketball or Golf If it comes in a pack I love to open it. This is not a dead hobby by any means. Look at the newer products and the prices they are demanding. Hobby stores have gone out of business because of mismanagement and greed. Honest dealers are alive and doing well. Don’t knock the hobby unless you are in it and support it. Trading cards are alive and well. I use to really enoy reading SCD. Untill they became auction central. Let me ask TS one simple question. Why does SCD not cover the newer issues with previews the way it use to? SCD went in another direction becoming an auction house magazine. TS you should really check some of these auction houses you allow in your magazines before you knock Sports Card Collecting and the people who collect. While I’m not at all surprised that SCD got their information wrong, I’m stunned that SI did nothing to fact-check the data. I have a current subscription to SI that I will most likely let expire now, as I find this type of reporting to be nothing more than tabloid journalism. I am an avid card collector myself. And I know there are 10’s of thousands of us still in Southern California. Collecting has changed with the online availability of cards, but we’re still out here in pretty strong numbers! The problem I see is the generation gap that’s approaching. The average kid can’t afford the packs today, nevermind boxes. I remember when I was 8-10 years old (I am now 26) going to card shows, flea markets, card shops, etc and could get packs for under $2 and come away with cool looking cards. My parents would buy me boxes of cards for under $75. In the 90’s, there weren’t many sets and it was easier to collect. These days, there seem to be hundreds of sets and it’s tough to keep track. The hobby is getting to be really expensive and is geared more towards adults. What happens when the current generations of adults leave the hobby due to passing away or moving on from the hobby? The kids of today don’t hold as much interest. I go to card shows and see mainly adults buying cards for investments. I don’t see kids going to have fun pulling cards from packs. Kids today are more interested in PS3, Xbox and other gaming systems along with fantasy sports. The hobby of collecting sports won’t die completely, but the baseball card industry needs to work on getting kids back. They need to stop producing 100’s of different sets. It’s sad when a no-name player’s rookie card is worth more than Ken Griffey Jr’s. I think Richard Hall (made a comment on this message board) made very good statements with strong merit. I also collect the cards that I care to purchase rather than buy packs and boxes. The prices these days are outrageous to the average collector. Great article. Every industry hits road blocks. But sports always bust through those road blocks. There’s a reason they’ve been around for one hundred years. I used to be an avid collector back in the 1990’s but my passion for collecting died after college thus I gave my collection to a kid who was just starting to collect at that time. Recently, I’ve been looking into the lone hobby shop (like what Ramesh mentioned) and thinking of going back into card collecting. I was quite surprised that the retail sale of a pack is not as affordable as it used to be back in the college days (considering that I am now working). I guess it’s probably due to the fact that most of the shops in the 1990s have closed and there is only one left behind which makes the price a bit costly. I think that it’s great that kids are still interested in baseball card collecting. I think the high dollar cards with autographs, game used fabric, etc. are great and keep the investors satisfied while kids can focus on collecting team sets, and common cards of favorite players like we used to when we were kids. 5% decline in this economy in any industry is doing good, especially in a hobby market. I thought it was interesting how you said that sports cards collectors are still enjoying the hobby and that the shops that sell them are doing okay. I imagine that there had to be a bit of change in dynamics in selling, for example, basketball cards. With the beginning of this technology based age I bet that basketball cards for sale online have become much more popular because you could have them delivered right to your door without having to leave your home.